So true it seems. Our friend John Hinderaker over at Power Line reflects on the just-released Obama administration 2015 budget proposal and President Obama’s own comments concerning the budget at an elementary school in Washington, D.C. earlier today. Obama’s full comments are here, and I just want to point out one of the most egregious comments in the third paragraph. The budget I sent Congress this morning lays out how we’ll implement this agenda in a balanced and responsible way. It’s a roadmap for creating jobs with good wages and expanding opportunity for all Americans. And at a time when our deficits have been cut in half, it allows us to meet our obligations to future generations without leaving them a mountain of debt. Oh. My. God. Is he joking? What parallel universe is this fool living in? I could not bring myself to analyze the statement, but Hinderaker did. This is mystifying. Currently the federal government is more than $17 trillion in debt. Obama’s budget proposal does nothing to reduce that debt; on the contrary, it adds hundreds of billions of dollars to it every year. If you believe the administration’s rosy economic projections, the budget would add $8.3 trillion to the national debt. Do go read the full post over at Power Line. Scared? Maybe you have good reason. Take New Poll! Obama: But what we can’t do is use this tragedy as one more occasion to turn on one another. 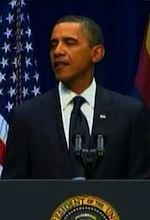 Anything Obama says is a straw-man argument meant to be played against Republicans in November.? Nothing less, nothing more.? His budgets have been a joke after he ramrodded through 2009 spending -?which has been the basis for CR’s as far as the eye can see. The public is finally beginning to see this charlatan for what he is. His approval rating has dropped to 38%. I know it is too late, I think it is impossible to impeach him. We have to double down and get every thinking, reasoning person to the polls. We need the Senate to try to stop the bleeding. He is following the agenda of ?the Progressives and will not deviate. Let the games begin! I think truth & reality are two things Barry has fled from his whole life. ?His mother was probably jail-bait when he was conceived, his father was a creep who he has somehow lionized, his mother’s family provided silver spoons, he was the token bright boy coddled in liberal universities while he wrapped himself in black-american issues- which were not his own while most quackademics were probably smitten by the cute little shape shifter who was down with the struggle but could also somehow engage their lofty intellect with trite and fluffy conversations about poor Jimmy Carter, that damned GOP, the coming of the “next ice-age”… ?All while rolling them the best dope they ever smoked! ? He is the epitome of the failure of “affirmative action”.? Time to reveal his records…. I won’t hold my breath though…. Barry got the sealed divorce papers on a political opponent once, but he’s apparently just as crafty at keeping his under wraps. ?He didn’t seal his records because he didn’t have anything to hide. ? 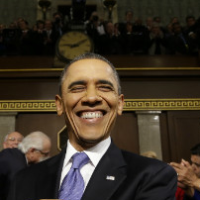 o has gone ‘all in’ on the self-fulfilling prophesy–it’s the last card in his hand.? No truth, no shame, no competence.? The ?bama way. Remember the ?bama speech claiming that “the Republicans just want to bamboozle you”?? (http://www.realclearpolitics.com/video/2010/08/02/obama_republicans_want_to_bamboozle_you.html)?Talk about projection!